In an age when anyone can become an instant journalist by relaying the realities of war by smartphone to the rest of the world, one might think the role of the military artist to be a thing of the past. And yet, every year, painters, photographers, and writers dedicate themselves to documenting and commenting on military experiences within and outside conflict zones. 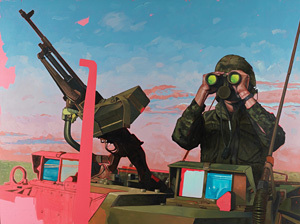 The exhibition, A Brush with War: Military Art from Korea to Afghanistan, invites us to explore a number of Canadian artists’ perspectives on conflict and the military environment. Becoming a military artist takes dedication. Privileged access to military sites and war theatres, as one can imagine, is not easily obtained. Over the years, Canada has created official military art programs to simplify matters. In 1916, during the First World War, Lord Beaverbrook established the first of these, the Canadian War Memorials Fund. This program enabled mostly British and Canadian civilian artists to produce over 800 paintings, sculptures, etchings and drawings for post-war display in Canada, London and New York. During the Second World War, Prime Minister Mackenzie King approved the creation of the Canadian War Records program, which by 1946 included over 6000 watercolours, drawings, and paintings. This time, the majority of the artists were recruited from the military. It would take another 20 years before the founding of the Canadian Armed Forces Civilian Artists Program (CAFCAP). Created during the Cold War, this program allowed artists to spend time with Canadian military personnel at home and abroad. The military events of the period – UN peacekeeping and NATO missions as well as the Gulf War – saw the creation of some 300 works, which historically have received little public exposure. Although CAFCAP ended in 1995, numerous artists continued to work independently in military and conflict zones where the Canadian Forces participated including Croatia, Haiti, Kosovo, and Somalia. In 2001, however, the Department of National Defence launched a new official scheme, the Canadian Forces Artists Program, which celebrates its 10th anniversary this year. Ten years of creation is cause for celebration! In collaboration with the Department of National Defence’s Directorate of History and Heritage, the Canadian War Museum held a symposium February 17, 2011 entitled ‘Military Art Now’ The First Ten Years (2001-2011) of the Canadian Forces Artists Program. The purpose of the event was to give artists who had taken part in the program the opportunity to discuss their experience. The symposium also shed a spotlight on A Brush with War: Military Art from Korea to Afghanistan, a fascinating exhibition of 64 pieces by artists who witnessed Canada’s military at work between 1946 and 2008. This exhibition provides a unique opportunity to become familiar with the varied ways – from traditional figurative representations to more subjective, abstract approaches – through which artists have responded to some of the military events that mark our collective history. Much of the artwork presented bears witness to Canada’s involvement in armed conflicts and the role that Canadian military personnel have played in them. But the works also take us on a journey through contemporary art and offer us an insightful panorama of evolving artistic approaches and techniques. The Canadian War Museum offers you a last chance to discover how military service and war captured the artistic imaginations of artists such as Alex Colville, A. Y. Jackson, Gertrude Kearns, William MacDonnell, Allan Harding MacKay, and Scott Waters: A Brush with War will be on display until March 20, 2011. This travelling exhibition will then make its way to Victoria and Calgary.